It is an honour to present the arrival of Teaching in a Digital Age – an open textbook in cIRcle, UBC’s Digital Repository! Many have described him as “insightful” as well as a “pioneer” and “expert”. Dr. Tony Bates can rightly be called “one-of-a-kind”. While “his hobbies include golf, skiing and flying a small plane”, his higher education and business career acumen spans over decades in the constantly shifting online/e-learning and distance education field. With twelve published books about online learning and distance education on his roster, his latest book is not merely just another book. Rather, it is a unique one in that it is a BCcampus Open Textbook which, Dr. Bates was pleased to say, has already been translated into Vietnamese and “is currently being translated into French, Chinese, and Portuguese”. Other forthcoming translations in the works will include Arabic and Farsi. Whether or not you have an e-reader, this open textbook is openly accessible and available in a variety of downloadable formats (PDF, EPUB, MOBI, HTML, XML). Using the in-browser viewing pane, you can view the PDFs. All other formats of this open textbook can be found within the “Download” section of the record. 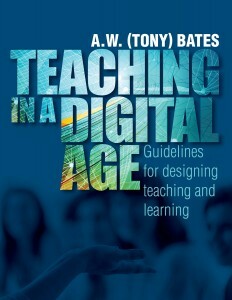 Drawing upon his insight and experience in this field amassed over the years, Dr. Bates catalyzed them and, as a result, authored the Teaching in a Digital Age open textbook with guidelines for faculty and instructors facing challenges and opportunities in the post-secondary sector due to new technologies and tools, like social media, found in today’s e-learning and distance education environment. When he released1 his open textbook back in April 2015, he pointed out that he is primarily reaching out to “college and university instructors anxious to improve their teaching or facing major challenges in the classroom”. He added that it also includes, “school teachers, particularly in secondary or high schools anxious to ensure their students are ready for either post-secondary education or a rapidly changing and highly uncertain job market”. • How do I decide whether my courses should be campus-based, blended or fully online? • What is the science and research that can best help me in my teaching? • What strategies work best when teaching in a technology-rich environment? • What methods of teaching are most effective for blended and online classes? • How do I make choices among all the available media, whether text, audio, video, computer, or social media, in order to benefit my students and my subject? • How do I maintain quality of teaching, learning, and resources in a rapidly changing learning environment? • What are the real possibilities for teaching and learning using MOOCs, OERS, open textbooks? As the author, Dr. Bates retains his copyright for his open textbook but what is noteworthy is that he has made it freely available and welcomes others to re-use, re-distribute, revise, re-mix and retain under a Creative Commons Attribution-NonCommercial 4.0 International License2. Earlier this week, Dr. Bates hand-delivered a printed copy of his 512-page open textbook to the Education Library branch located in the UBC Faculty of Education’s Neville Scarfe Building3. Further, he reported that his “book has been very successful with 22,000 downloads of the English version since its publication in April last year” compared to his other published book experiences. Read his one-on-one Q&A interview4 with University Affairs back in August 2015. It is a pleasure to know that Dr. Bates has indeed found a permanent home to preserve his Teaching in a Digital Age open textbook over the long-term via cIRcle, UBC’s Digital Repository. Stay tuned for more translations of this digital book version coming to cIRcle in the future!